Though Silicon Valley may still struggle for gender equality in tech jobs, other U.S. cities are faring better. Here are 10 locations inching closer to gender equality and equal pay. It’s no secret that Silicon Valley tech companies have a gender equality problem. Of the companies that released diversity reports last year, Twitter, Facebook, Yahoo, Microsoft and Google ranked among the worst, reporting that between 13 percent and 18 percent of its tech jobs were held by women. At the top, as the most-inclusive of women in technology roles, were eBay (24 percent), Apple (22 percent) and Intel (20 percent) — still, all far below the target ratio. Though Silicon Valley has a lot of work to do to reach gender equality, other U.S. cities are faring better, according to a new report by financial software and data firm SmartAsset, which compiled a list of the top cities for women in technology. SmartAsset analyzed 58 of the largest U.S. cities with a tech workforce large enough for statistically significant Census survey results. For each of the cities, it considered four criteria: women as a percentage of the tech workforce; gender pay gap in tech; income after housing costs; and three-year tech employment growth, it said. While those numbers may sound discouraging, the news isn’t so bleak in other cities across the U.S.: A handful have realized pay equality between men and women in tech, and two cities reported the percentage of women in the tech workforce has peaked at just over 40 percent. The top 10 cities for women in tech have narrowed the gender pay gap, offer a formidable income after housing costs and, of course, hold a better-than-average percentage of tech jobs filled by women. Here’s how they stack up. Fremont, Calif., is the only Bay Area city to rank among the top cities for women in tech, according to the report. After factoring in housing costs, women who live and work in Fremont have a higher average income than those in San Francisco and Oakland, at $70,886 after housing costs. SmartAsset reports that 25 percent of tech jobs in Fremont are filled by women, and expect tech employment to grow by 16 percent over the next three years. Though Denver, Colo., lags behind the rest of the country with only 24.2 percent of tech jobs filled by women, it ranks among the top U.S. cities for pay equality, according to the report. 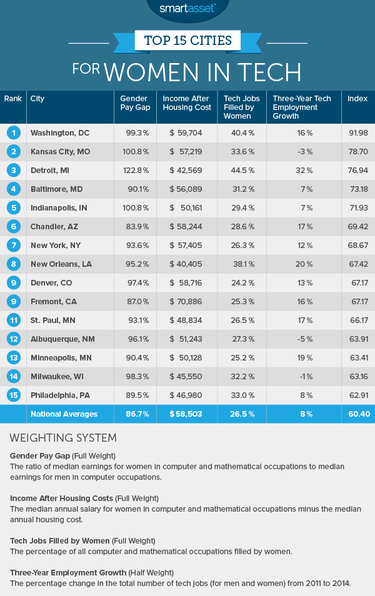 Women in Denver earn a median income of $72,012 while men earn $73, 908. Denver expects tech jobs to grow by 13 percent over the next three years. Women hold 38 percent of tech jobs in New Orleans, the third-highest ratio of the cities in SmartAsset’s study. “Organizations such as New Orleans Women in Tech have worked to foster a more inclusive culture for women in the technology industry, which is reflected in the data or workforce demographics,” the report says. Though the city ranked the lowest of the top cities for income after housing costs at $40,405, jobs are expected to grow by 20 percent over the next three years—the second-highest growth rate. New York City is home to a number of tech startups founded by women, the report says, though it ranks on the lower end of tech jobs filled by women, at 26.3 percent. Despite its high cost of living, New York women in technology maintain one of the higher salaries after housing costs, at $57,405, according to the report. Chandler, Ariz., is home to a number of major tech companies, including Intel and PayPal, which employ more than 13,000 people in the Chandler area, the report says. Despite the concentration of tech talent, Chandler ranked the lowest of the top cities closing the gender pay gap, at just 83.9 percent. Lower housing costs, however, make Chandler an attractive city: It ranks fourth for income after housing costs, at $58,244. Chandler also expects strong employment growth at 17 percent over the next three years. Indianapolis is one of just three U.S. cities in which earnings for women in technology jobs is equal to or higher than men in those same jobs, according to the report. U.S. Census data pegs median pay for women in tech jobs in the city at $60,181, while the median pay for men $59,713. Though women in Baltimore hold 31.2 percent of tech jobs, it’s well above the average of 26.5 percent, the report says. That, combined with a below-average pay gap (90.1 percent) and a higher income after housing costs ($56,089) help earn Baltimore the No. 4 slot. Detroit ranked first for three of the four metrics that SmartAsset considered for its analysis: it’s three-year tech employment growth (32 percent), percentage of women holding tech jobs (44.5 percent) and pay ratio (122.8 percent). Despite its high rankings, it lags in overall pay, the report says. “Even when taking into account the low cost of housing in Detroit, the level of pay for women in the city’s tech industry ranks as the twelfth-lowest among the 58 states in SmartAsset’s analysis,” it says. 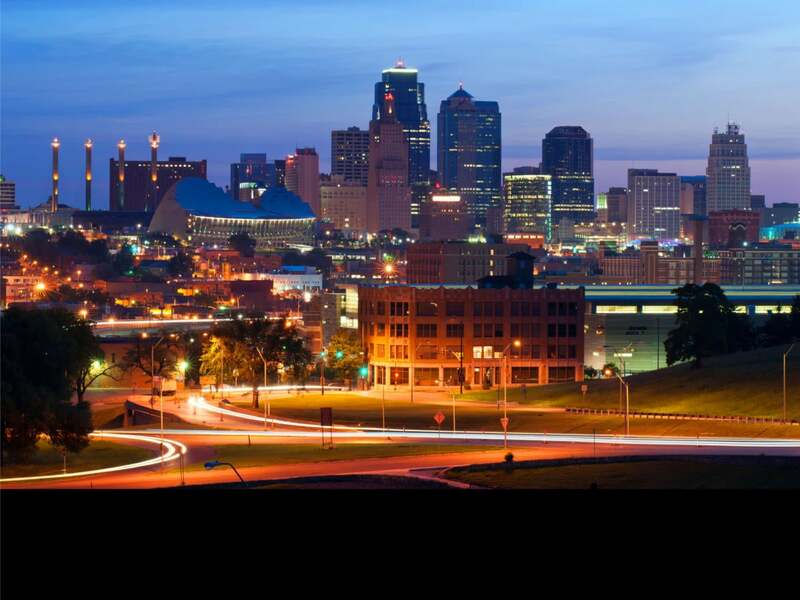 For the second year in a row, Kansas City ranks No. 2 as best city for women in technology. It’s one of three cities where women in tech are paid higher than their male counterparts—about a $500 difference, the report says. About a third (33.6 percent) of the city’s tech jobs are filled by women. Washington ranks No. 1 overall and holds the highest percentage of tech jobs filled by women at 40.4 percent, according to the report. 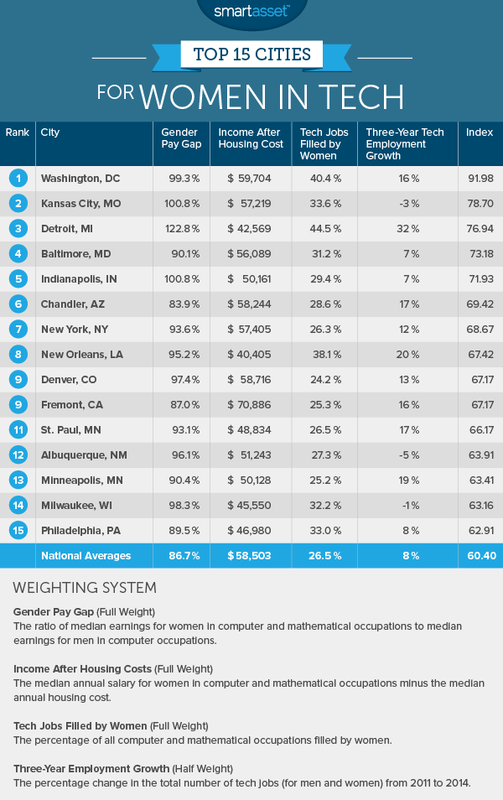 That, combined with a nearly nonexistant gender pay gap (99.3 percent) and formidable incomes after housing costs ($59,704) ranks the nation’s capital as the top city for women in technology, according to SmartAsset.